Seller: fletcherart (22,660) 99.9%, Location: Warren, Maine, Ships to: Worldwide, Item: 372609895187 50701. 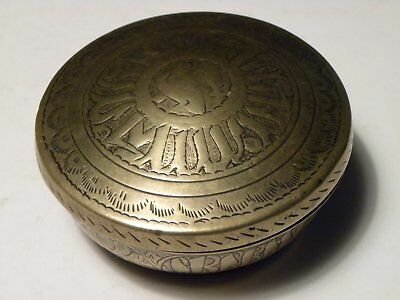 19th c. Islamic Spun Brass Engraved Gunpowder Container with Inscriptions, tight screw-on lid, makers stamp inside bottom 1 1/2" x 3 1/4" diam. Nice wear and patina to outside, interior bright. Please email questions. I guarantee absolute satisfaction or your money back I do combine shipping, any quantity costs the same as one to send. Seller - 22,660+ items sold. 0.1% negative feedback. Top-Rated Plus! Top-Rated Seller, 30-day return policy, ships in 1 business day with tracking. 22,660+ items sold. 0.1% negative feedback. Top-Rated Plus! Top-Rated Seller, 30-day return policy, ships in 1 business day with tracking.